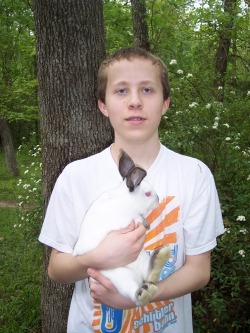 I began my rabbit project in the fall of 2006 after joining the Willis 4-H Club. I started out with a trio of Californian rabbits which included two Does and one Buck that I purchased from the Legget Store in Livingston, Texas. 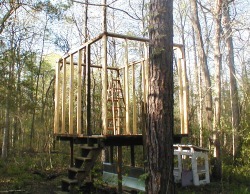 When I first started my rabbit project I used my old tree house, "The Fort" to shelter my rabbits. 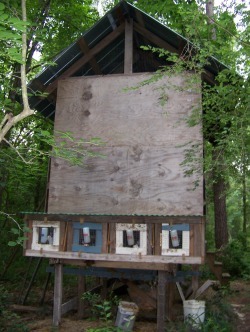 The Fort was thereafter renamed to "Fort Rabbit". 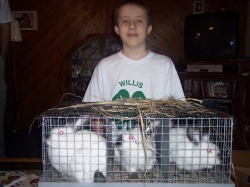 My dad helped me build wooden structured cages covered by wire to house my new rabbits. I started out using spare bowls to feed and water my rabbits. After getting my new rabbits situated I decieded to give them names. I named my buck "Rocky", my younger doe "Cornflower" and my older doe "Cregga". The names came from my favorite books at the time, The Redwall Series by Brian Jacques. My first year started out as a disapointment. Cregga didn't have any bunnies in January after she was bred in December. Cornflower had two bunnies but they both died. I remember going to the rabbit project meeting the following month, held by Mr. Lemons without any bunnies for the Montgomery Country Fair. Someone at the rabbit project meeting was talking about how they had forty-eight bunnies! My first year proved to be a learning experience as well. As I spent time with my rabbits I learned a lot about handling them effectively and the general care required when raising rabbits. The year of 2008 started out as an excitement as I found out, that I had thirteen bunnies for the Montgomery County Fair! 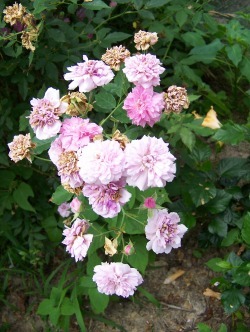 In the spring of 2007 Cornflower had four bunnies. Her daughter "Fate" had now had seven bunnies and Cornflower now had another six bunnies. I spent lots of time holding and watching my new bunnies. My rabbit project leader helped me pick out my meat pen the night before the county fair. I had two exceptionally good rabbits but we couldn't find a third one to match them. We had to compromise and stick a smaller rabbit into the trio. On saturday the day of the show I held my breath as the judge put a coin by my pen. I tried to figure out if the coin was good or bad. Finally after the judge had finished looking at all the rabbits he took out the pens without coins and sent them off the judging table. The coins turned out to be good and my pen had made it into to the second round! Again the judge went around and felt the remaining rabbits and took out another large group. My pen had again made it to the next round! Now out of the approximately fifty-five original pens mine was one of the fifteen remaining on the judging table! The judge then lined up the pens starting with 1st place on the right. My pen was ranked number thirteen which was the third alternate for the sale! The judge then made a comment about the rabbit in my pen that lacked size compared to the other two and then announced my name as the thirteenth place winner. I was excited that I had done so well on my first year with a meat pen. My meat pen got to stay at the county fair for the next few days because it was the third alternate in the sale. Nobody ended up dropping out of the auction and my pen had to be taken home. Although it seemed disapointing at the time, the two execellent does in my pen have proved to be execellent mothers. "That year something unusual happened, I was thirteen years old, I had thirteen bunnies born for the fair and I made thirteenth place. I will also graduate in the year 2013!"